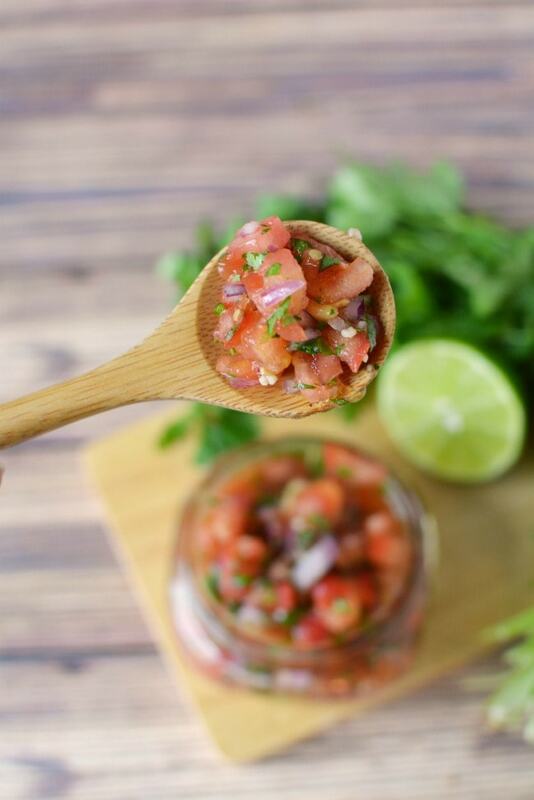 Simple, Homemade Pico De Gallo Recipe! 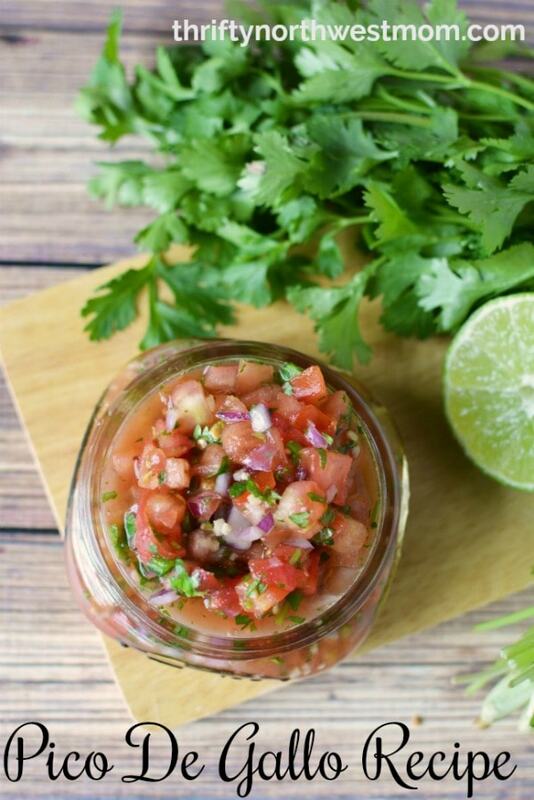 Homemade Pico De Gallo, is one of my favorite recipes year round, not just for Cinco De Mayo. Plus this time of the year is a great time to make it as its easier to get the ingredient for less, and they are fresher (you might even grow some of these in your garden! 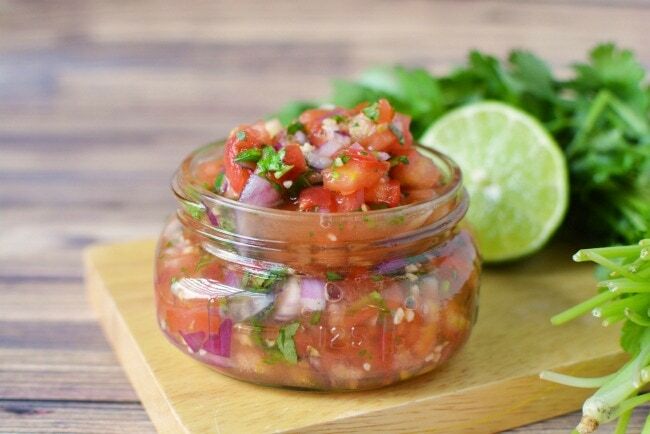 Homemade pico de gallo makes everything taste better to me (well, just about anything). I love the fresh taste it adds to Mexican dishes, but is also great with chicken, steak and as an appetizer or snack if you have friends. I add it to my salads and we just made omelettes with it last night that were delicious. Plus it has the added bonus of being healthy! I use to be intimidated by the idea of making it from scratch, but then I did a semester in college in Mexico (Guadalajara), and have been making one variety or another ever since. 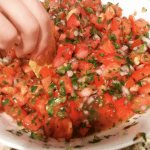 If you are looking for an affordable way to entertain, make a big batch of this and then grab a couple of bags of tortilla chips (I can usually find the Kroger brand for $1 a bag at Fred Meyer), and people are impressed! I made a batch this week that took me about 20 minutes to put together. I then save it in a mason jar (I use these heritage style jars) and use it all week long on various recipes. 1) Dice up the tomatoes (I buy what is on sale. Make sure they are firm) and add to bowl. 2) Dice up the onion (again I buy what is on sale, I will substitute white or yellow onions if that is what I have on hand. A red onion will add a little more kick, but your choice. Also, you can increase or decrease the onion depending on your taste). Add your onions to the bowl with tomatoes. One trick to dicing your onions. Cut it in half from top to bottom (so there is half of the root side left on each side of the onion). Place it flat side down on your cutting board, and slice vertically towards to the root (but not all the way through the onion – so there is about a quarter inch of the onion, where the root is, that is not being cut). Then hold at the root and dice horizontally when you are done with verticle slices. This keeps the onion slices from sliding all around while you are dicing. 3) Dice up the Jalapeno, finely, and add to bowl. I do NOT seed it (remove the inside of it). Lots of the heat is in the Jalepeno seeds, so if you like a little kick to your pico di gallo, just cut off the stem and dice the rest of it up. If you like it a bit more mild, remove the seeds first. 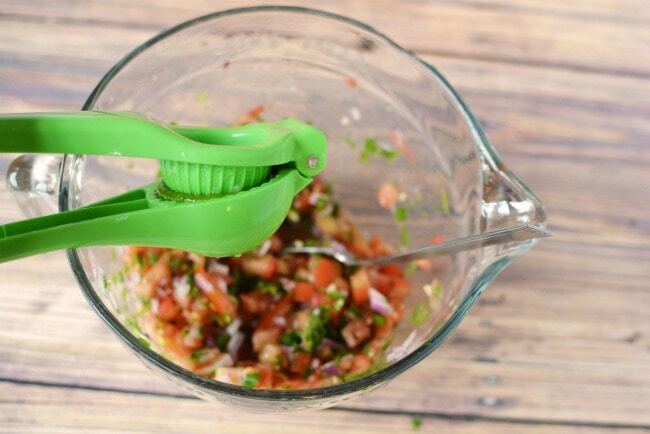 4) Finely chop up half the bunch of cilantro (be sure to wash first), and add to bowl (we love cilantro, but you can adjust the amount depending on your taste). 5) Squeeze the juice of one lime over the mixture (or two, if they are small). 6) Add salt to taste (we use about 2 tsp.). Salt is important in this recipe, it brings out the rest of the flavors. 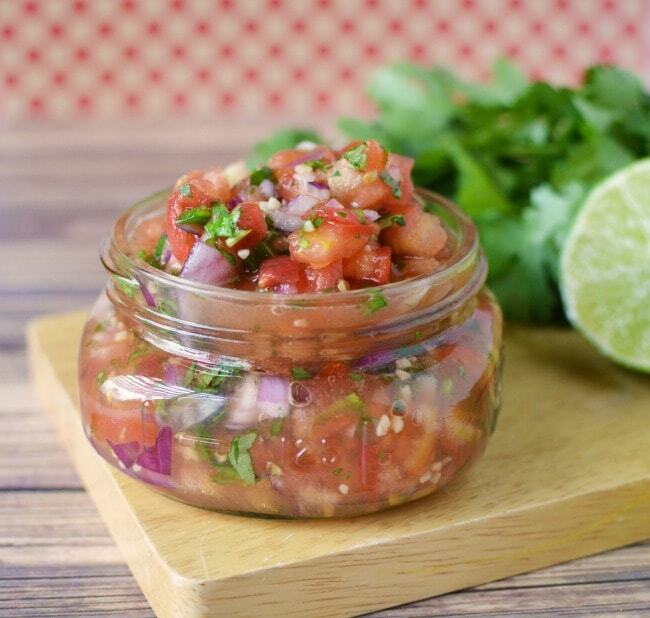 The Pico Di Gallo will be bland without it. Gently mix it all together. Add to a serving bowl, and put out some chips – and you are ready to entertain. 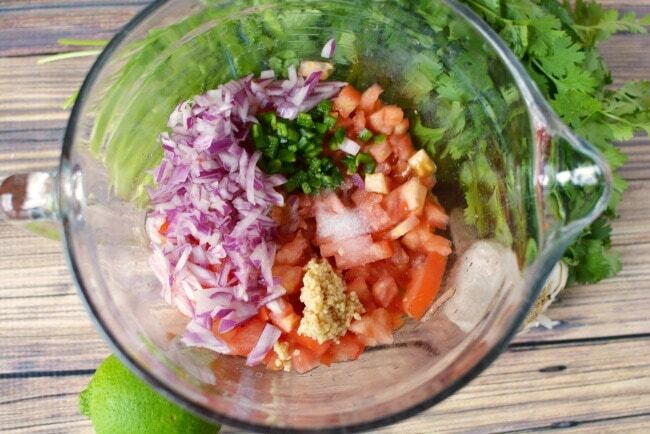 Short on time or budget, you can dice up the onion and cilantro, add lime juice and salt, and gently stir for another great (but cheaper) topping for tacos or burritos, etc. 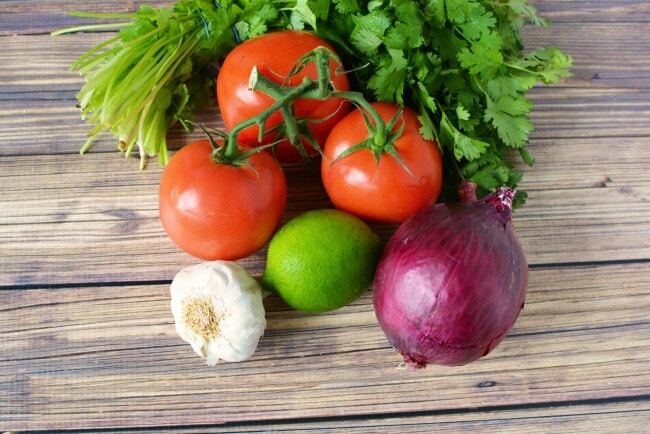 I was just up at Fred Meyer, and the Cilantro was around $.60 a bunch, limes were $.20 ea and an onion cost me under $1, so it is pretty easy on the budget and has always been a hit at any spot there was Mexican food to accompany it, that I have been. Put in a bowl, and add a small spoon for people to serve themselves. You could do something simple like been and cheese quesadillas to go with this topping, if you are looking for a more hearty dish. Here’s a printable version of the Homemade Pico de Gallo recipe for you to print off to put in your recipe binder or notebook. 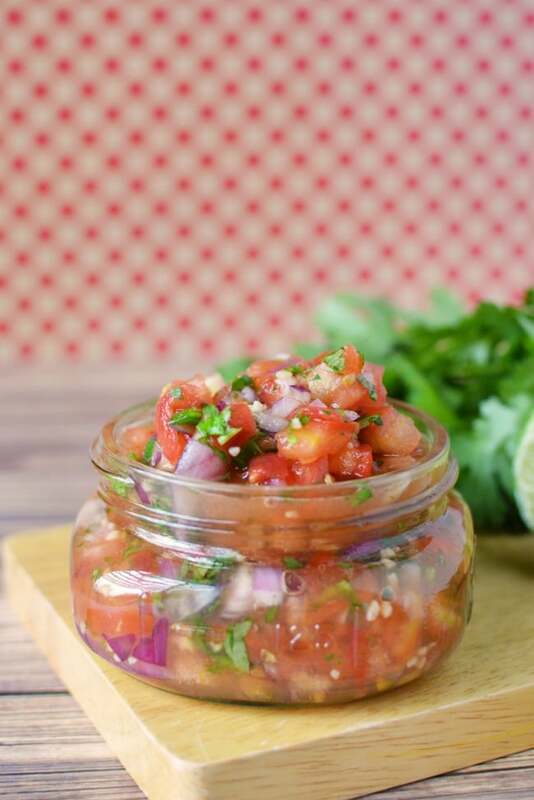 This Homemade Pico de Gallo has all the flavors just right for dipping or topping on your favorite dishes! Dice up the tomatoes and add to bowl. Dice up the onion Add your onions to the bowl with tomatoes. Dice up the Jalapeno, finely, and add to bowl. I do NOT seed it (remove the inside of it). 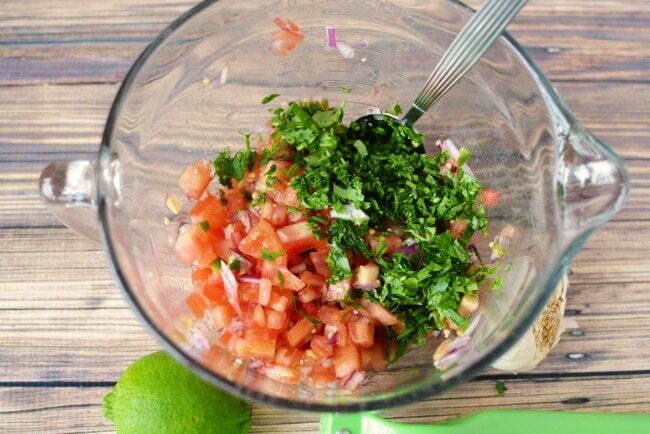 Finely chop up half the bunch of cilantro (be sure to wash first), and add to bowl. Squeeze the juice of one lime over the mixture (or two, if they are small). Add salt to taste. Gently mix it all together. My recipe is similar. Garlic is the other ingredient I add. Good to know Katie, think I will try adding some too next time I whip a batch up – sounds good!